"I offer you urgent advice, to make an effort to always embellish with fine gold, especially in figure of our Lady, and if you wish to reply that a poor person cannot afford the outlay, I answer that if you do your work well, you will get such a reputation that a wealthy person will come to compensate you, and even if you were not adequately paid, God will reward you for it." Gold Leaf Studios specializes in the gilding of frames, furniture, decorative objects, sculptures and architectural elements. 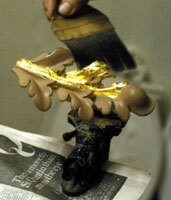 William Adair and our craftsmen have decades of experience gilding important and unusual objects. Much of our gilding is done using Renaissance techniques and tools. 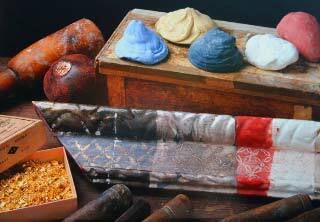 Adair teaches several water gilding workshops a year at museums and educational institutions. He instructs students in traditional Renaissance-era gilding techniques. Following the class, students take home their gilded frame as a trophy. In addition to his adult-oriented class, Adair teaches gilding workshops to school children to promote the art of gilding and artisanship as a career.